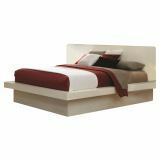 This sleek storage bed is crafted with solid wood and select veneers with a glossy smooth Cappuccino finish. 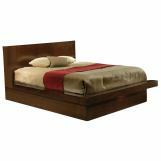 The bed features a rectangular polished wood headboard with three lighted cubbies perfect for showcasing decorative modern accessories. Three romantic lights are strategically placed in each nook with an on/off switch close at hand. 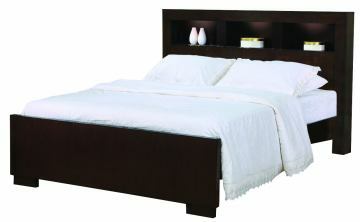 The simple smooth wood footboard has chunky block feet adding to the impressive appearance of this harmonious design. 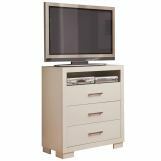 This bedroom collection by Coaster Furniture Company offers the ultimate in modern styling with its sleek appearance, clean simple lines, and glossy smooth Cappuccino finish. 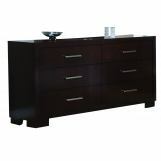 Crafted with solid wood and select veneers, the collection features dramatic stainless drawer pulls and highly polished surfaces. The harmonious balance and symmetrical design of this sleek collection will make the perfect addition to your contemporary home. 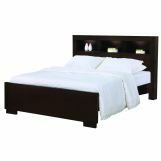 Do you need to have a box-spring with the Jessica Platform Bed or can you just use a mattress? Best Answer: No boxspring needed. Is the bed fully assembled on delivery have concerns on getting thru entry way? Best Answer: We have different delivery options. Please call 212-518-2752 for more information. Are there drawers on the side of the bed? Coaster description says there are drawers but can't see it in the picture. Best Answer: There are no drawers on this bed. Where is the light switch located? Best Answer: It's a switch that's activated with your touch and located on the left side of the bed when you are looking at the bed or the right side of the bed when you are laying in the bed.